If you haven't seen a luminous glow from the Rio Hotel and Casino, then you've been missing out on a real treat. The Global Winter Wonderland has been lighting up the nights this holiday season since it opened last month. The wonderland features towers in the north lot of the hotel illuminating beautiful eco-friendly lanterns that span up to 50 feet high and 100 feet long. 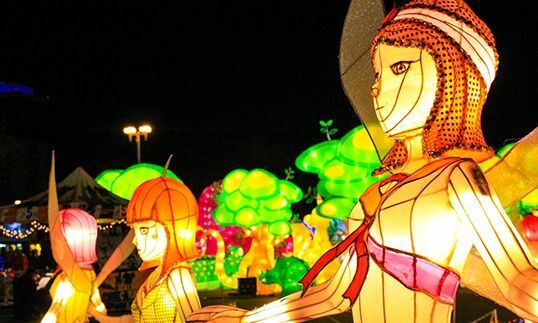 Families of all ages can explore 15 acres of beautifully illuminated sights, each representing famous landmarks or cultural symbols from different parts of the world. As guests, you can travel the world in one night and venture from Australia's outback, to Africa's safari, to the famous Eiffel Tower in Paris and landing back to the United States to visit lady Liberty and Mt. Rushmore. After traveling across the globe, you can visit the North Pole and see Santa and his elves working together in his workshop while checking out a final display of an illuminated winter wonderland. Other features to enjoy in the park include exciting live entertainment, carnival rides and games, and different international foods and beverages. This year, the tour has also added two ball pits, one for adults and the other for children. Guests 21 years and up can enjoy a unique nightlife experience with a LED-lit ball pit, cocktail bar and DJ. Children can enjoy an interactive ball pit in Kid Zone, located near the amusements park rides and games. The Global Winter Wonderland is on its last week of tour in Las Vegas, with doors closing the night of Sunday, Jan. 20th. For days & hours of operation, along with ticket pricing & purchases, visit globalwonderland.com. Be sure to follow them on Instagram at @globalwonderlandlv to keep up to date on all the latest from its current tour.